Editing terrain in UE3 is accomplished via the TerrainEdit dialog. This dialog combines the terrain editing toolbar with the layer browser capability to provide a single floating dialog through which the majority of terrain operations can occur. 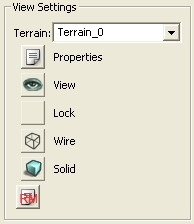 The Terrain Editor is opened by switching to 'Terrain Edit Mode' on the toolbar. Figure 1: The TerrainEdit dialog. Each section of the terrain editor will be explained below. Figure 2: The Tools Block. This tool will add or remove sectors to existing terrains in any direction. This tool is limited to adding/remove MaxTesselationLevel patches. The cursor must move the size of the patches to add/remove. CTRL-left click will start the tool for adding sectors, while CTRL-right click will start the tool for removing sectors. Hold the button and dragging will overlay the outline of the patches that will be added/removed. Added patches will show up in a green overlay, removed will show up in red. When the button is released, the patches are added/removed and the terrain location is offset to account for the difference, if necessary. This tool is currently unavailable. When selected, the tool will 'paint' the selected layer on the terrain when CTRL -left mouse is pressed. It will 'un-paint' (remove the layer) if CTRL -right mouse is pressed. When the heightmap is selected in the layer browser, CTRL-left will raise the height of the terrain, while CTRL-right will lower the height. Painting across terrains is supported to enable proper matching of separate terrain edges. When selected, the tool allows for selecting vertices directly and moving them up or down, giving the ability to easily match up terrain edges with static meshes, etc. in the editor. To select vertices, CTRL-left click. To deselect vertices, CTRL-right click. Note that the select/deselect actions are additive operations. To clear all currently selected vertices, hit CTRL-ALT-SHIFT-right click. To move selected vertices, CTRL-ALT-left click and move the mouse up or down. If the ‘SoftSelect’ option in the Settings box is checked, vertices selection/deselection will be 100% within the center circle of the tool, and vertices within the falloff radius will be selected at diminishing weights going from Min to Max radius. Vertices that are selected at 100% will display a white ball hovering over them, with the color fading to black as the weight falls to 0. If SoftSelect is not checked, the vertices that completely contain the tool circle will be selected (ie, a square around the tool circle will be selected at 100%). The Strength setting is multiplied by the selected vertex weight and the amount of mouse movement to move the vertices when editing. This tool will flatten the terrain to the height of the terrain at the time of the CTRL-left click if the height-map is selected. 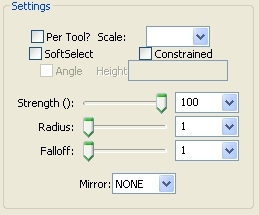 If the ‘Angle’ box in the Settings section is checked, the terrain will be flattened to the angle determined at the time of the CTRL-left click. Additionally, if the ‘Angle’ box is unchecked and there is a value in the ‘Height’ box in the Settings section, the terrain will be flattened to the supplied value. This tool is currently unavailable. It’s functionality is supplied through the ‘Height’ Settings entry as described above, and it will be removed in the future. This tool will smooth the terrain about the center point clicked. If the height-map is selected, it will adjust the heights. If a layer is selected, it will smooth the alpha map values. This tool will set the affected points to the average of all of them. Applicable to either height or layer mappings. This tool will inject noise into the selected layer/height-map. This tool will paint holes in the terrain if CTRL-left is clicked; it will remove holes if CTRL-right is clicked. The tool is constrained to MaxTesselationLevel to avoid disappearing holes when detail is removed from the terrain. This tool will pan the texture of the currently selected terrain material in the browser window when CTRL-left is clicked and the mouse is dragged. This tool will rotate the texture of the currently selected terrain material in the browser window when CTRL-left is clicked and the mouse is dragged. This tool will scale the texture of the currently selected terrain material in the browser window when CTRL-left is clicked and the mouse is dragged. This tool will split the terrain along the currently selected X axis. When enabled, a yellow line will render where the split will occur. CTRL-left clicking will cause the split to occur. This tool will split the terrain along the currently selected Y axis. When enabled, a yellow line will render where the split will occur. CTRL-left clicking will cause the split to occur. This tool will merge two neighboring terrains provided they match up appropriately. When enabled, a yellow line will render where the merge will occur. If the merge is not possible, no line will appear. CTRL-left clicking will cause the merge to occur. This tool will flip the edge orientation of a terrain patch. CTRL-Left clicking will flip the edges to the opposite of the default orientation. CTRL-Right clicking will restore the edges to the default orientation. Note that edge flipping is only valid at the highest tessellation level. The following image shows the Tool Settings controls. Figure 3: The Tool Settings Block. When checked, the settings will be applied to the currently active tool only. When checked, the vertex paint/edit tool will utilize soft selection of vertices. When checked, if the terrain EditorTessellationLevel is set to something other than 0, editing will only affect the vertices at the set tessellation. Higher detail vertices will be automatically set to match the plane determined by their edited neighbors. This control is only enabled when the Flatten tool is active. If checked at that time, the flatten tool will utilize the angle determined when the tool is activated.. This control is only enabled when the Flatten tool is active. If the Angle option is unchecked and there is a value in this box, the flatten tool will use the value as the height to flatten to. These allow for 'creating' and using custom brush sizes for use in terrain editing. Note that you can adjust the radius and falloff dynamically. Hold down SHIFT or ALT and roll the mouse wheel while editing your terrain to set them visually. NONE Do not mirror the tool. The following image shows the View Settings controls associated with terrain. Figure 4: The View Settings Block. This combo allows for selecting the terrain to edit from all present terrain actors. When pressed, this will bring up the property window for the currently selected terrain. When the 'eye' is present, the terrain will be in view. When clicked, the button will change to an 'empty' icon, and the terrain will be hidden in level. When the 'empty' icon is present, the terrain can be edited. When clicked, the button will change to a padlock icon, and the terrain will NOT accept any editing commands. Not implemented at this time. When pressed, all shaders applied to the current terrain will be recompiled. 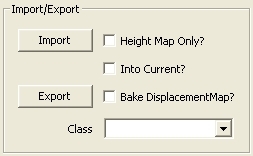 The following image shows the Import/Export controls associated with terrain. Figure 5: The Import/Export Block. Allows for the import of height maps (from 16-bit BMP files), layer alpha maps (from 16-bit BMP files), or terrain (from T3D files). To import a height map, the ‘HeightMap Only?’ option must be checked, and the height map must be selected in the terrain browser. To import an alpha map, the ‘HeightMap Only?’ and ‘Into Current?’ options must be checked, and a terrain layer must be selected in the terrain browser. Allows for the export of height maps (to 16-bit BMP files) or terrain (to T3D files). To export a height map, the ‘HeightMap Only?’ option must be checked, and the height map must be selected in the terrain browser. To export an alpha map, the ‘HeightMap Only?’ option must be checked, and a terrain layer must be selected in the terrain browser. If checked, when the Import/Export button is pressed, the operation will take place for a height-map only. If a layer is selected in the terrain browser window and this checkbox is pressed, the alpha map will be imported/exported. If checked along with the ‘Height Map Only?’ checkbox, when the Import button is pressed, the heightmap will be imported into the terrain currently selected in the View Setting Terrain combo-box. NOTE: The imported height map has to match the dimensions of the terrain it is being imported into, otherwise the operation will fail. Determines the factory used when importing/exporting a height-map. The following image shows the Brush selection controls associated with terrain. Figure 6: The Brush Block. This block of controls allows for the selection of pre-set brush sizes. 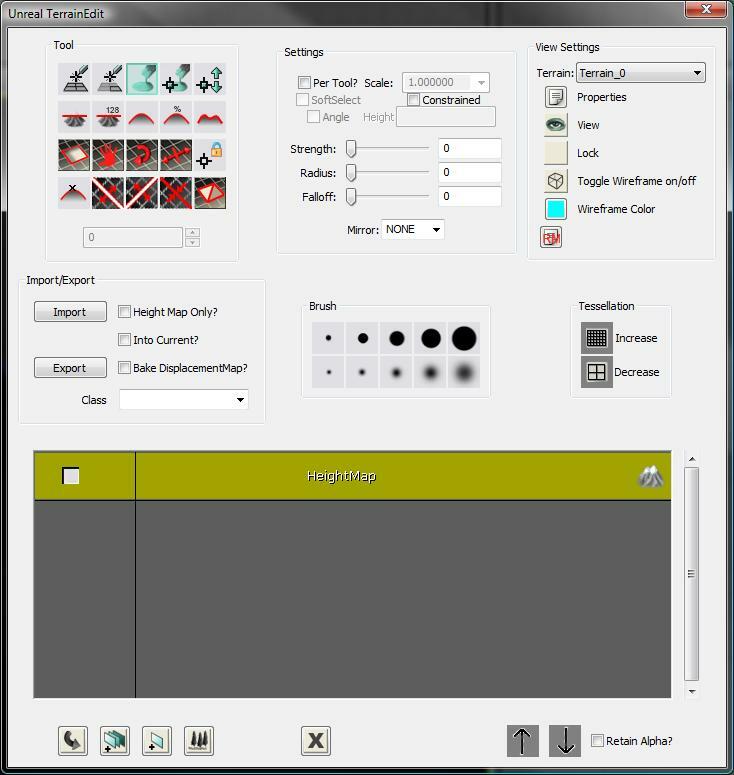 If you use the sliders to set custom values, you can right-click one of the brushes and store the values in the brush button. 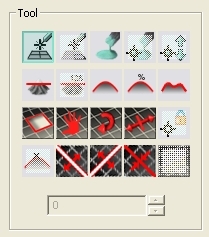 Holding the mouse cursor over a brush will display the stored settings in the tool tip window. The following image shows the Tessellation controls. Figure 7: The Tessellation Control Block. When pressed, this button will increase the max tessellation of the current terrain. The following image shows a snapshot of the integrated Terrain Browser. Figure 8: The Terrain Browser. This window provides a visual representation of the terrain. It functions in a similar manner to the previously implement TerrainBrowser window. A context-sensitive right-click menu provide users with the ability to perform most terrain generation tasks completely within this dialog. A new addition to the browser window is to auto-create a layer from a material selected in the Generic Browser. When selected, the editor will automatically generate a terrain material, stored in the map package, with the name TMAT_ as well as a terrain layer setup with the name TLS_. This is intended to simplify the setup of terrain. The following image shows the controls located along the bottom of the dialog. Figure 9: The 'Bottom-Bar' Controls. Use the item selected in the generic browser. This is useful for assigning TerrainLayerSetups, TerrainMaterials, etc. Add a new TerrainLayer to the terrain. Add a new TerrainMaterial to the terrain. A Layer must be selected in the browser. Add a new DecoLayer to the terrain. Delete the selected item from the terrain. Allows for shifting layers up within the array. Allows for shifting layers down within the array. NOTE: The first five buttons will likely be removed as their functionality is now supplied via the right-click context menu in the browser window. For information on setting up Terrain and a reference to Terrain properties, see the Setting up Terrain page. For a full reference on terrain properties, please refer to the Terrain Reference page.